Start Castle Hill pub, limited parking. Comment This is a long return so leave plenty of time and daylight. The start involves some road walking but thereafter is varied countryside and orchards. 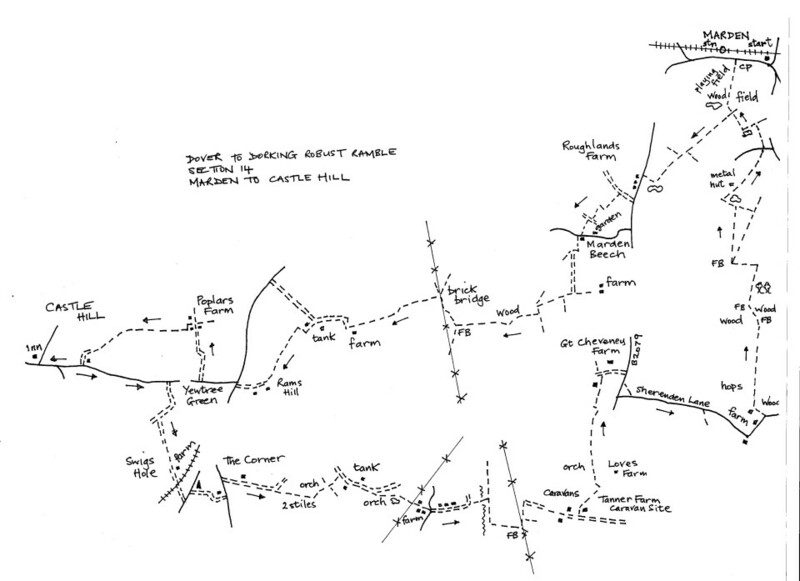 The route twists and turns so keep your place on the map, passing by Tanner Farm Caravan Park. Crossing large fields needs a good sense of direction. With the Castle Hill Inn behind, walk back down Yew Tree Green Road for ¾ mile. Pass a road going off right to Horsmonden. Keep on down passing houses and footpaths going off left and right. When houses finish, pass woods on both sides and two ponds on the right. Where the trees on the right finish and fields begin, turn right on a farm track through double metal fieldgates, away from the road. Stay on this rough vehicle drive as it winds down then up and around through the sites of former orchards. Eventually it drops down towards a barn in the valley below. At a Y-fork, bear left onto a concrete track that continues down and by the buildings of Swig’s Hole Farm, including a fine Jacobean farmhouse. Continue up the entrance drive, under an old railway bridge, to a road. Turn left on the road, downhill, for 100 metres. Just before an oast on the right, turn right off the road on a farm track. Keep along by a garden fence on your left to a wooden swing gate (alpacas in nearby field). Through this follow a broad green track past a house on the left. Keep on as the track narrows between trees. Go up to and through gates to soon reach a road. Turn left, downhill, looking out for a triangle of tracks on the right called ‘The Corner’. Turn right here up a drive to ‘Cacketts’, passing a setback house on your left. Follow the drive up to an entrance gate. Here go right over a stile into a field. Ignore a path going off right uphill and turn left, along the edge of the field, with a fence and trees on your left. At the end of the field reach a stile by a fieldgate. Cross into a paddock. Bear diagonally left a few paces across to a second stile into a larger paddock. Cross this in the same diagonal direction up to the top left corner. Here there are two stiles close together. Cross both to enter an orchard. Walk down the edge with a tall hedge of trees on your right. Where the hedge ends, keep on downhill, on a broad green way between fruit trees. Cross a track and keep on down to a junction with a farm track just before the bottom of the slope. Turn right on this track. Soon pass a brick building on the right, then a water tank by a stream on the left. The track begins to go steeply uphill. Halfway up the slope, where a hedge goes off left and trees start on right, turn right off the farm track into a corner of orchard. The path should go diagonally left uphill to trees around a pond but the orchard rows are in the way. So turn left up the edge of the orchard with a line of mature trees on your left. In a short distance, at the top of the slope, turn right uphill. Soon reach the pond and its surrounding oak trees. Turn left and skirt the pond swinging right up the far side to meet a grassy farm track. Turn left down through orchards. Continue for some way, through a gap in the hedge and on with a tall hedge on the right, towards power lines. Go underneath these. At the end of the orchards, go through an old gate into a woodyard. Keep forward on a narrow concrete path. Soon go through a wicket gate into a gravel parking area. Turn left along the permissive path to emerge onto a road. Cross slightly left to a driveway going steeply downhill. Keep on past houses for some way. Where the drive ends, keep forward on a grassy way to reach a junction of tracks with horse paddocks ahead. Ignore the stile ahead and turn sharp right along by a stream and hedge on your right. At a corner, go through a gap into the corner of a large rough pasture. Follow the hedge on the right for some way, notice power lines crossing the field away on the left. Keep an eye on the power lines. When opposite the place where the lines leave the field and go off uphill (about 50 metres from the end of the field ahead), turn left, away from the field edge, and walk across the open field aiming just left of a pylon in trees. Leave the field through a gap into trees and cross a wide footbridge. Keep forward down the side of the field ahead to a corner with power lines overhead. Turn left here along the top edge of a long field. Keep along with a hedge on your right for a good distance (ignore a path off into woods on the right soon reached). On reaching a grassy track on the right turn up it towards oasts and farm buildings at the top. These are the buildings of Tanner Farm Caravan Site. Pass a barn on your right and bear left to the entrance drive by the reception building. Turn right on the drive for a short distance looking for a path on the left going into an enclosed path by a house with trees and an old brick wall on your right. At the end of the wall, keep forward over a gravel track, with stored caravans on your left, to rejoin the enclosed path. At the end emerge into a field. Go straight across the field in the same direction as before to a gap. Cross a ditch into an orchard. Walk up the orchard to a stile of concrete blocks in the hedge at the top. Continue uphill through a further orchard towards oasts in the distance. On reaching a hedge go on with it on your right. Pass Love’s Farm buildings over on the right. On reaching a corner, bear left, then soon right, still by the hedge. Ahead are the buildings of Great Cheveney Farm. Bear left to an enclosed path passing to the right of a black weatherboarded bungalow. Soon reach a crossing of farm roads by an ancient barn and pond. Turn right and follow the main farm entrance drive down and out to the main B2079 road. Turn right along this. In 50 metres, look out for a footpath on the left. Go diagonally right across the corner of the field to emerge, though a large gap onto a country road (if this path is overgrown, continue along the main road and turn left at the next junction). Turn left along this road (Sherenden Lane) for ½ mile. It turns sharp left by a cottage, then continues, passing farm buildings on your left. Where it approaches a wood and swings right, turn left, off the road, into the entrance to Huggin’s Farm. Before the main buildings, bear right towards a telegraph pole, past a small garage, to a field edge. Turn left here for a short way, past a brick outbuilding. Immediately past this, turn right, up a grassy track, with rows of hops on your left (it’s possible there may be hops on both sides). At the top of this hop garden do not enter the wood but turn right for a few paces looking for a footbridge on the left. Cross and continue ahead with a field on the right and woodland on the left. Look for a footbridge on the left in 150 metres and cross into the wood. Bear right on a path going through the wood over a footbridge midway to the top edge of the wood. There is no proper stile or footbridge so scramble out to the edge of a large field. The path goes away from the wood, straight across the field towards the lefthand end of a large group of trees ahead. Walk across to these trees then on, passing the trees on your right. Keep forward to reach a corner of hedge at the far side with an orchard beyond. Turn left to follow the field edge with the hedge on your right. Walk along for 150 metres looking for a gap in the hedge on the right. Go over a two plank footbridge into a rising field. The path is waymarked as going slightly left right up the centre of this huge field, over the brow of the hill to reach the righthand end of a hedge that stretches halfway across the field at the far side (if the path is not reinstated through crops, go up the side until opposite the end of the hedge over on the left, then turn left and walk across the open field to meet it). On reaching the end of the hedge turn left to walk along with the hedge on your right, passing a pond on the right as you go. Soon reach a corner and turn right, out of the field, over a footbridge into the bottom corner of an orchard. Walk up with a hedge on your left for about 50 metres looking for a gap in the hedge by a metal hut. Enter a rising field. Bear right on a track between new trees, going up across the centre of the field (do not be tempted to follow the hedge on the left), to the top opposite corner. Pass a pond on your right just before exiting the field onto a road. Cross the road to enter the field opposite and continue along the field edge with a hedge and trees on your right. At the top corner, go through a gap into the field ahead. Turn immediately left (not as indicated on the OS map), along the field edge. At the corner ahead, by a pond, turn right still along the field edge with a hedge on your left. Keep on for some way right to the far end of the field, then bear right still along the edge of the field, now with a wood on your left. Soon reach a footbridge. Cross into the corner of a playing field (this is now the route of the outward section). Walk up the recreation ground and the footpath beyond to a road. Turn right to pass the library and car park and return to ‘The Unicorn’ in Marden village centre and the start of the section.